This kit is designed to enable handlers to provide lifesaving treatment to injured canines at the point of injury or when veterinary care is not immediately available. 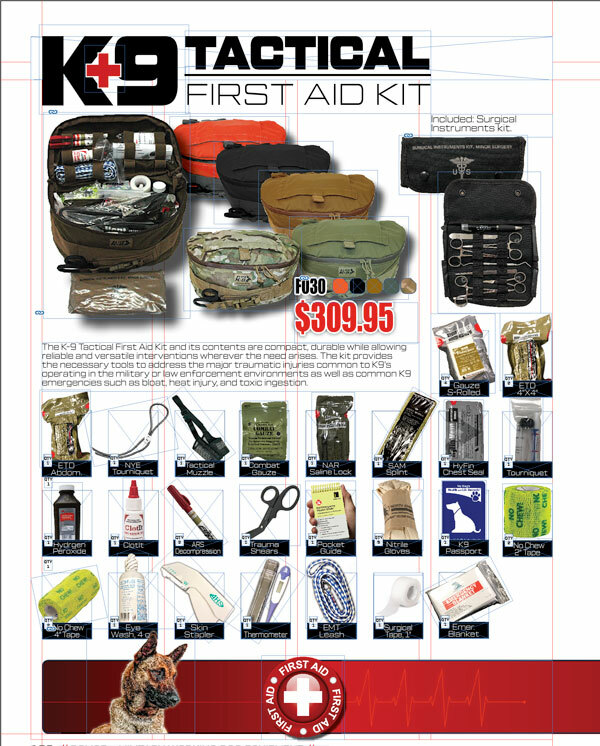 This kit and its contents are compact, durable and allow reliable and versatile interventions wherever the need arises. The kit provides the necessary tools to address the major traumatic injuries common to K-9’s operating in the military and law enforcement environment as well as common K-9 emergencies such as bloat, heat injury, and toxic ingestion. Offering a large central compartment and multiple attachment points, this kit maximizes storage space while maintaining a compact profile. The kit can be slung over the shoulder in bandolier fashion, hand-carried, or worn around the waist as a belly-bag. Your K-9 partner would defend you with his life; don’t leave his to chance.